Although Thanksgiving has passed, I have ingredients beckoning me to remake the infamous orange rolls that don our Thanksgiving table year after year. In fact, they were made and presented on our family table long before I came along. I best check, but I am pretty sure I am third generation on these little savory sweet spirally gems and this year, my son became the fourth generation. He made these special orange rolls with me, knowing exactly what he was in for and just like I did when I was his age, he was looking forward to the stack of rolls he would enjoy over the course of Thanksgiving Day. One cannot possibly eat enough of them, and should they ever replace a traditional pie-eating contest, many generations of my family---child after child plucking them out of a warm, cloth-lined basket---would not hesitate to line up and stuff orange rolls into their ready mouths. On good memories alone, their psychological preparedness, would equip them to out-eat any would-be orange roll competitor. Stand aside all you plain roll eaters, here come the orange roll inhalers! Heat oven to 375. Mix Bisquick and egg/OJ mix; knead slightly and roll into 1/2 inch thick rectangle. Use Bisquick to flour countertop prior to rolling out dough (I skip the rolling and just use my fingers to press out a rough rectangle). Brush with melted butter, sprinkle with sugar orange peel mix. Roll up from one long side to the other, cut in 1 inch slices and place on oiled cookie sheet. Bake 8-10 minutes. 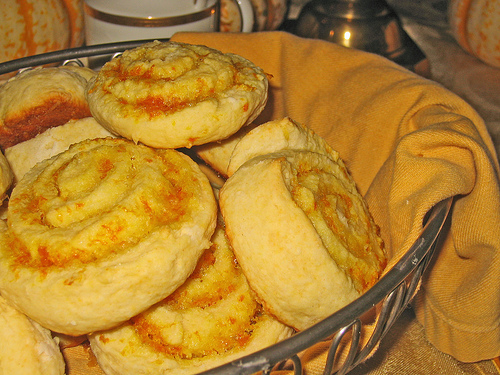 Luisa at The Wednesday Chef inspired me to write this post, after I read her scrumptuous description of Wheat and Cornmeal Cheese Rolls. Hats off to baskets of rolls adorning tables everywhere!